Description: A large black bird with white flight feathers, the black swan has a bright red bill with a pale tip. Their legs and feet are greyish-black. Cobs (males) are slightly larger than pens (females), with a longer and straighter bill. 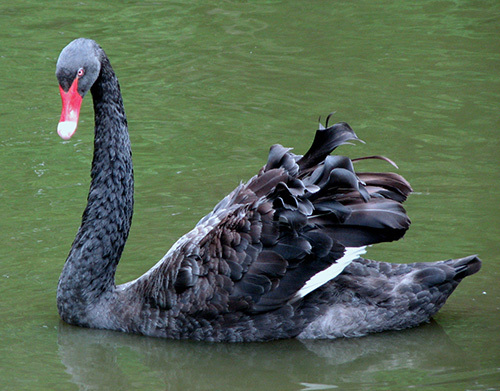 A mature black swan weighs 3.5-9 kg (8.2–20 lbs) with a wing span of 1.5-2 m (5-6.6 ft). Black swans have a musical and far reaching bugle-like call as well as a range of softer crooning notes, when disturbed, black swans will whistle. 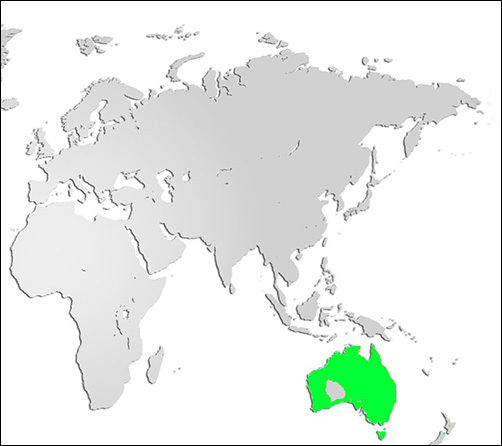 Distribution and Habitat: Native to Australia, the preferred nesting habitat for black swans is a permanent fresh, brackish, or marine wetland area but they can be found in temporarily flooded areas. Black swans are nomadic with no set migratory pattern, tending to move in response to increased rainfall or drought. Very popular ornamental birds, black swans are found in captivity all around the world. Diet: Mainly herbivores, black swans eat aquatic and terrestrial vegetation, and occasionally insects. Life Cycle: The female lays 4-8 greenish-white eggs that are incubated for about 35–40 days. Cygnets (young swans) are cared for by both parents and are greyish-brown with pale grey feather tips. Adaptations: Their long necks allow them to forage for plants deeper underwater, and their bills have fine grooves along them for gripping food. Did you know?Black Swans are the official bird of Western Australia and are featured on the flag and in the coat of arms.